They just look like slim-cut trousers to me. But all this confusion is understandable, as the article points out, "now it takes a dictionary...to distinguish between the gaucho, gangster, peg, crop, skinny flare, super-wide leg, sailor, pyjama, and drop-crotched harem, zoave, lungi, jodhpur, and dhoti." Although of course, for people whose job it is to know which is which, getting all these mixed-up is a major booboo! So let's traverse the tricky waters of trouserland together, because we are dedicated followers of fashion and we all got to get it right, goshdarnit! After this, we can all call each other smarty pants and be proud of it! 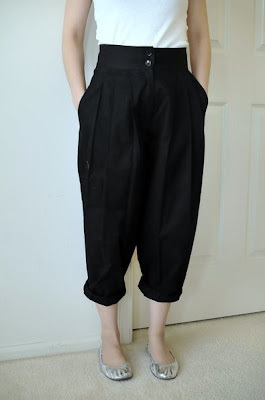 While wide legs, cigarette pants, sailor pants and pajama pants are pretty straightforward and need no explanation, I think the most common mistake is using jodhpurs and harem pants interchangeably. So let's start with jodhpurs, which are also often confused with riding breeches. Either way, a pair is meant to be worn for horseback riding, but of course Nicolas Ghesquière of Balenciaga changed the course of jodhpurs history in Fall 2007. As seen above, a pair of jodhpurs is characterized by a snug fit to the knee, with flaring hips. The snug fit from the knee down was designed to accommodate riding boots. The flaring hips allow the rider to move and be comfortable, especially when out for long rides. Real jodhpurs usually have reinforced patching on the seat and knees to prolong the life of the pants from riding wear and tear. Oh, and here's a bit of trivia, Jodhpurs were originally named after an Indian city, where the royals would play polo and wear pants tight around the legs and baggier around the hips. Although, let me point out too that modern day jodhpurs may also be tight-fitting all throughout, akin to leggings. So jodhpurs, should be associated with riding style pants, okidoks? And are surprisingly flattering for people of all shapes and sizes! Trust me on this! I was about five months pregnant in those two photos, and I'm barely over 5 feet tall. See, the billowy shape hides the belly, without making me look like the shortie that I really am. Sometimes, you just have to try something before saying no to a trend. 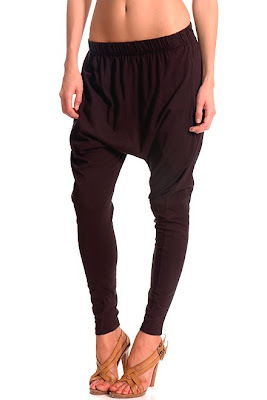 Now drop-crotch pants may be referred to as harem pants as the former falls into the latter category. Harem pants are also known as dhoti, sarouel, and zouave pants. What the heck, you may also call it Hammer pants. love the shoes on the pictures, any deets on those? ate tin, i had jodhpurs from M&S back in 1994. i saw it on the clothes show live (now defunct tv & magazine show) and went to get me some (and no, i didnt use it for horseriding.. just thought they looked cool in the mag). anyway, they're not necessarily baggy on the hips, but they did have the extra patches on the bum and knees/inner thighs legs area. i got myself a nice pair of jodhpurs at marks and spencers and i absolutely love the fit! i would have never known the details of those pants if i had not read them here. thanx for the info! Yes, I know! I remember that Trina! Heehee! You're welcome Mitzi! =) As for harem pants, just try. I thought I wasn't a harem pants type of person too, but because of my expanding belly, it just suddenly made sense heehee! It really is the year of the pants, don't you think? Totally agree Anon! Year of the Extreme Pants I would say, heehee!